The World Cup match between France and Australia will start in less than 24 hours. UPVOTE the comment "FRA - France win”. UPVOTE the comment “AUS - Australia win”. UPVOTE the comment “TIE - No winner”. Your upvote must be done BEFORE 2018-06-16 10:00:00 UTC to be valid! 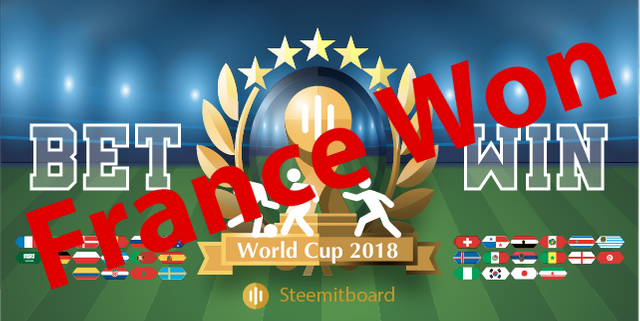 Do not forget to register the contest by sending 0.010 SBD or 0.010 STEEM to @steemitboardpool with “worldcup2018” in the memo. This is a one time registration. Anyone wishing to join the list of sponsors to help increase the prize pool is welcome! Contact @arcange on steemit.chat if you are interested. Replying to this comment will be considered a fault. You will receive a red card (flag) and will be excluded from the match (no badge)! Yes, you can enter the contest whenever you wa t.
hola no entiendo muy bien, hay que pagar cada vez que quieras dar un resultado, o solo se transfiere una sola vez. Una sola vez se paga y ya estás registrado.